In the previous part of this series we saw how to determine the capacity of a server farm. This time we will look at how that capacity is utilized, in other words at farm load. As before we will do that for the four main components of a XenApp server separately: CPU, memory, storage and network. How many users per server? What is the utilization of CPU, memory, network? Are there individual processes with high CPU/memory usage? After adding a few additional columns, Task Manager happily displays IO counts, too. Having examined several systems like this, you should have a rough idea of the utilization of each of the four key system components (CPU, memory, storage and network). For example you might have come to the conclusion that the servers are memory-constrained, CPU load is rather low, disk IO is high mainly during logon hours and the NICS are heavily underused (that is a combination I have seen lately). In the next step, we will verify the initial assessment with measurements. Perfmon is the way to go here. The most relevant counters for understanding system performance are listed below. However, there is one caveat: Windows does not tell us the amount of memory that is used (which is what we really want to know) but the amount of memory that is available. Calculation of consumed memory requires knowledge of the total amount of memory installed in a system. See the previous article for that. This creates one data collector set on each server in the list, adds all the counters from Counters.txt to the set, sets the output format to CSV, the output file to Servername.csv, the sampling interval to 60 seconds and the total runtime (collection duration) to 24 hours. 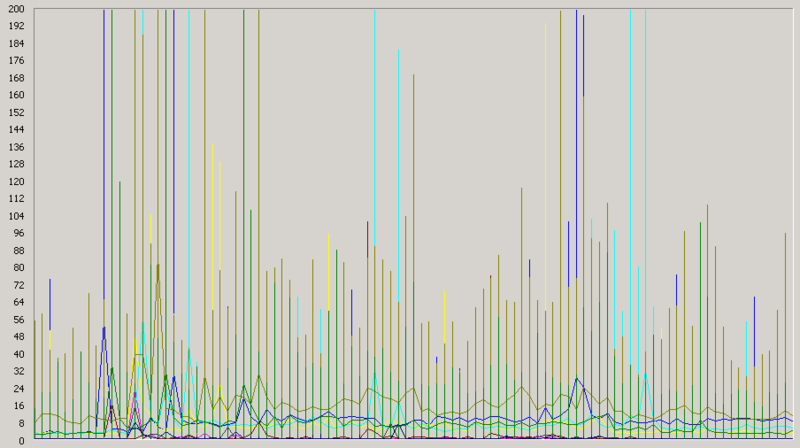 Once performance data from a typical work day is available, analyze two or three individual servers. Perform the analysis per component (CPU, memory, storage, network). For each component, create a chart that depicts total session count and the counter for the component. 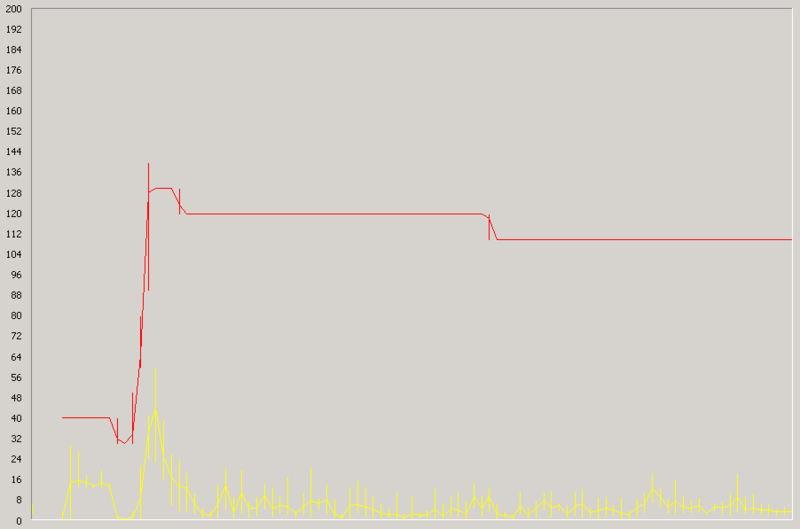 The yellow graph represents CPU utilization in percent, the red graph the total number of sessions (multiplied by 10 to fit into the same scale). It is obvious that during the morning logon time as the session count increases, CPU utilization is noticeable, though not high. 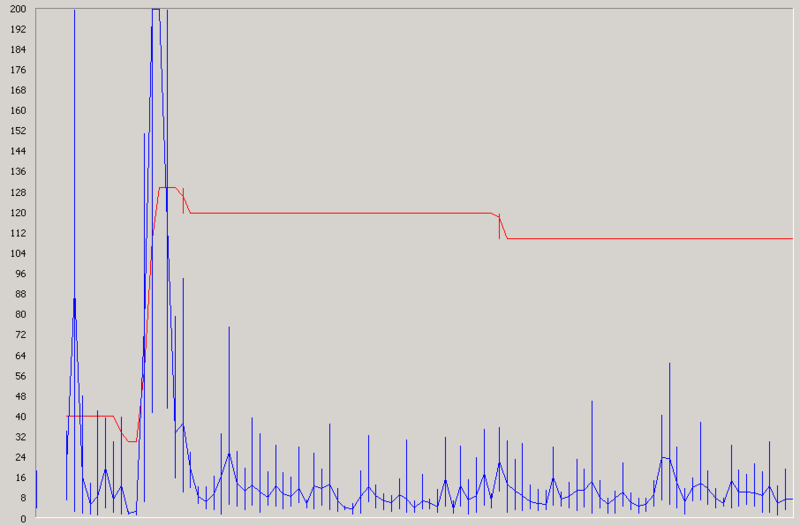 During the rest of the day CPU utilization is negligible. This machine is obviously not CPU-limited. This is very good evidence that the farm’s CPU load is light, rarely crossing the 40% threshold, often being below 20%. When analysing such a chart do not fall into the trap of thinking that there is lots of RAM available because the graph does not reach zero. If you want a snappy system (and happy users) you need several hundred megabytes for the file system cache. This server could do with a little more RAM, for example. 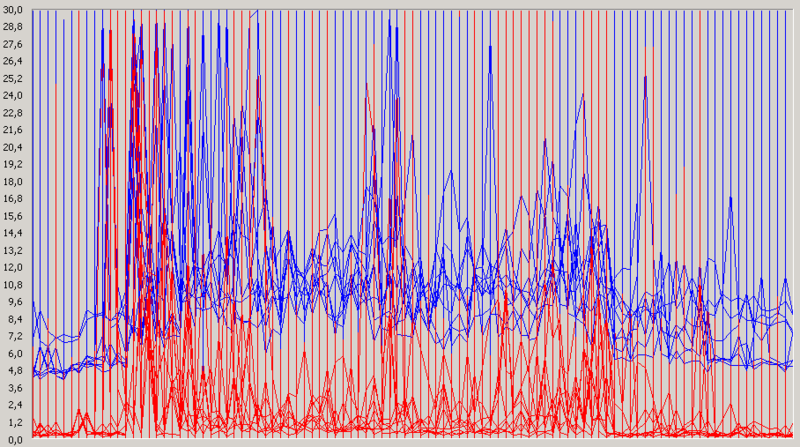 The blue graph shows the disk queue length multiplied by 100. A queue length of 2 is considered full load for a single active disk. 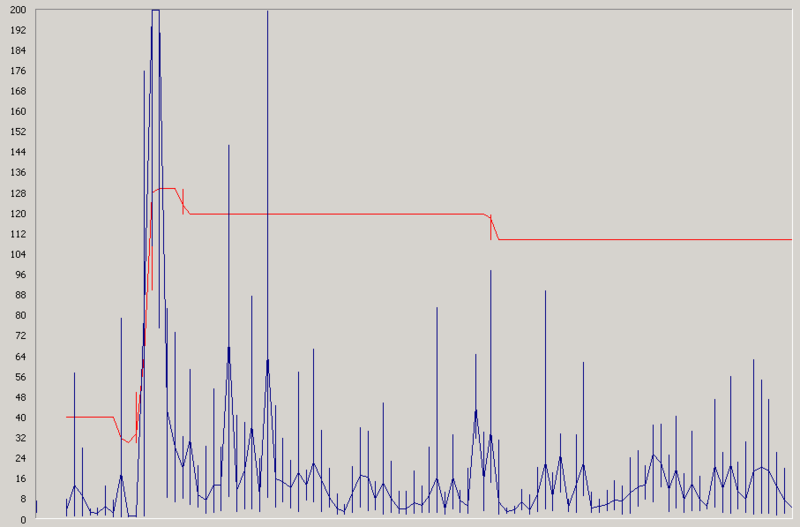 In a typical RAID-1 configuration, only one disk is active, so the value of 200 in the chart represents full load. As disk performance is critical for application responsiveness this server’s disks should be considered being under medium load. As before, the overlay confirms the analysis. With the system in steady state (i.e. 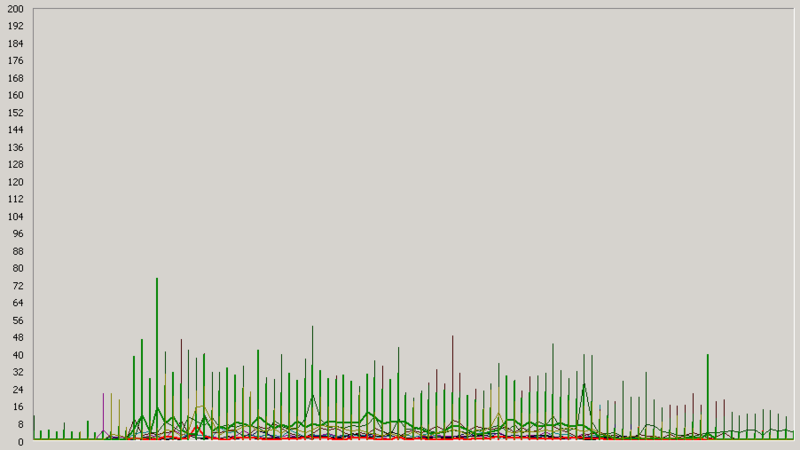 booted up), the number of writes (blue) is much higher than the number of reads (red). 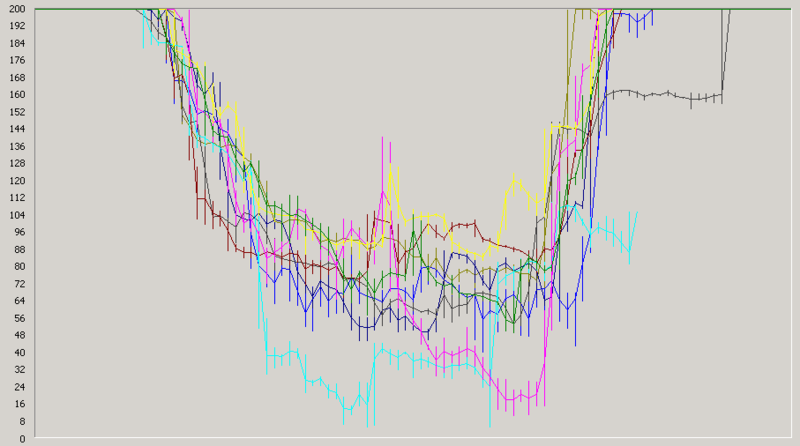 We want a good reaction time from the system, so we use peak values instead of averages. The combined peak read and write IOPS of this machine is at around 60. 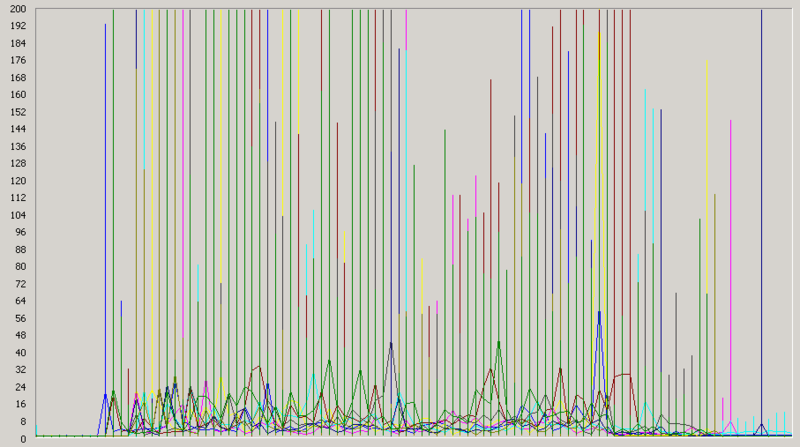 When looking at the network chart please note that a value of 200 corresponds to only 2 MB/s. This is an extremely light load. Now that we know each component’s capacity and load, we can go about calculating the size of the new farm. That is the topic of the next article. I found that I had to start the TSPerf counter on each server (logman start TSPerf). It also appears that only time stamps are being written to the CSV files. Will the system write all the data at the end of 24 hours? 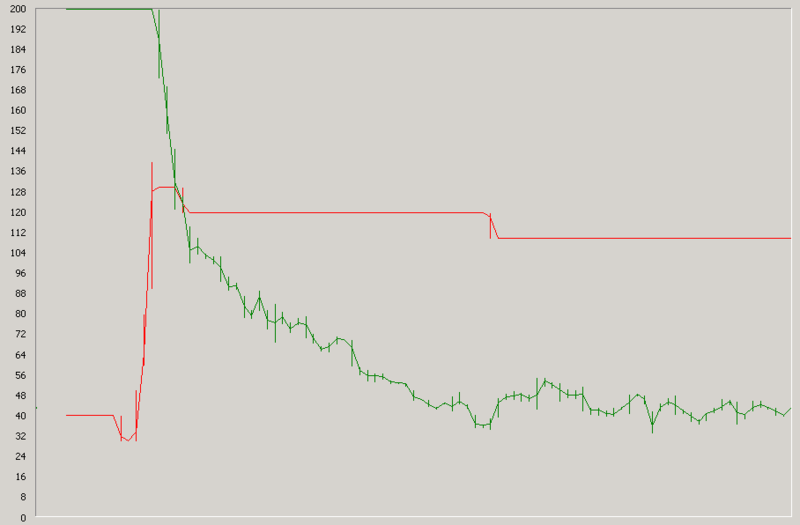 I ran the logman on 2008 servers. This is a great series and I’m using it to validate my current farm’s capacity and plan for a major upgrade. thanks for finding that bug: yes, the data collection needs to be started after creation! But I honestly cannot remember how the CSV data is written. Please try out for yourself. Thanks! I have updated the article.